This blog entry about the events of Monday, December 24, 2007 was originally posted on January 15, 2008. IT WAS JUST ME celebrating Christmas in Colombia with Monica’s family; on the early morning of the 24th, Stephanie departed for the Yucatan to rendezvous with her vacationing family, so that the four of them could, amongst the usual things to do in the Cancun area, celebrate a traditional “Jewish Christmas” together (Chinese food and a movie, of course). The night before she left, Steph and I had said our goodbyes after a day of shopping, an evening of people watching at a Juan Valdez Café, and one last night hanging in and around the trendy Parque 93 area with Camillo — the one she’d met on the plane, not to be confused with his friend “Camillo 2,” or Camilla (Belize/Guatemala), or “Camilla 2” (who I met briefly in San Salvador). “Damn Camill people,” Steph had joked to me. “What does Camillo mean anyway?” I asked Camillo (1). BUT I DIGRESS. With Steph gone and all our new Colombian friends leaving for family holiday vacations in warmer Colombian towns as well, I was on my broken-Spanish-speaking lonesome to be with Monica’s family — not just for Christmas, but another celebration: Hugo and Gloria’s fortieth wedding anniversary on the 24th of December. It wasn’t so much an extravaganza but a small renewal-of-vows ceremony in a small Catholic church in their old neighborhood on the other side of town. Where they used to live, they had a huge house with five bedrooms, a two-car garage, and plenty of friendly neighbors — some of which still live in the area. As great a home it was, it had been sequestered by the city to be torn down to make room for the TransMileno above-ground mass transit system — which may or may not have been true; buses don’t run over their old plot of land, it’s now just an empty lot on a street corner. “[The city gives you a lot of money for the house? ]” I asked Hugo in Spanish, trying to use the past tense for “give” but only knowing the present. “[No. Not much,]” he answered with a sighing frown. No matter, there was celebration to be had — and video taped by me. For a small collection of close friends and family, a private mass was held in the church, where Hugo and Gloria, looking quite stately and distinguished, each renewed their vows. In the end, they remained a happy couple, just as they had the past four decades. DRIVING THROUGH AND OUT OF TOWN with Hugo at the wheel was an amusing time. Wearing his Santa hat, he played his “Colombian music!” on the radio while waving to all the passers-by, wishing nearby strangers “Feliz Navidad!” He was a jovial and jolly Colombian Santa Claus (picture above) spreading the Christmas cheer, proclaiming everything to be “chèvre” (great) as he had been since day one. We eventually made it out to the suburbs, not too far out from the city, but far enough to accommodate for big houses, with big yards flanked by the mountains. We arrived there relatively early (before sundown), and I passed the time hanging outside with Monica’s ten-year-old second cousin Mariana and her brother Victor Hugo. As we drank beers (sans Mariana), Monica’s older sibling with the French playwright’s name became more and more social when he spoke to me about life in Colombia — plus he proudly showed off his vintage Oldsmobile Cutlass Supreme. “[That’s like my father’s first car,]” I told him in Spanish. He laughed with enthusiasm. “[This is one of four(?) of these cars in the whole country! ]” Victor Hugo raved, being happier with it than his now-crashed BMW; fixing up his Oldsmobile was his latest obsessive hobby. Smiles only ran in the family as the evening progressed. Gradually, around twenty people showed up for a casual evening of family fun around the Christmas tree: drinking beers and shots of whiskey, watching music videos from Colombian pop crooner Juanes, and passing the mic around for Spanish kareoke. Of course, it should probably go without say that salsa dancing was involved, with people pairing off, regardless of age, to sway their bodies to the infectious Latin sounds and rhythms of brass and percussion. I danced with Monica’s aunt, who was quite forgiving with my novice skill level — but I managed to get by with multiple takes to the dance floor. As midnight approached, the merriment ceased momentarily for a short rosary prayer session; Christmas after all was still a religious holiday, at least in those parts (or at least in that house). At the stroke of midnight, cheers around the room — and the entire country for that matter — sounded with wishes of “Feliz Navidad!” Everyone greeting each other with hugs and kisses, all before food was served: a simple meal of meat and potatoes, complemented with more beer and more whiskey. Not surprisingly, inebriation was inevitable, but all in the name of good fun (and baby Jesus). The party continued in the early morning with a roll call by the Christmas tree, as each gift was individually distributed to its receiver. Like a kid fearing to be picked last for a team in gym class, I waited in anticipation to see if there was anything for me — although honestly, I wasn’t expecting anything really. Just near the end of the pile, when fifteen minutes of gift distribution went by, my name was finally called. “Erik!” I heard Monica’s aunt announce. Looks went around the room; not everyone knew who I was, or what my name was. For some, the family Christmas party went until dawn, but I only made it until about 2:30 when I jumped on the opportunity for a lift back to the city with Hugo and Gloria. 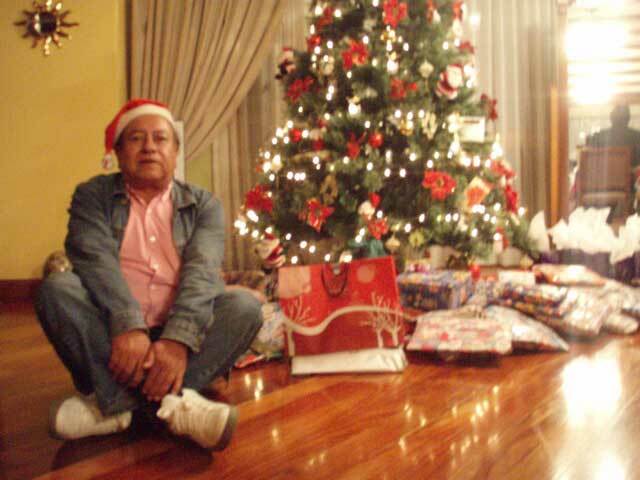 I’d had my fill of Christmas in Colombia anyway — even before dawn of the 25th. THE ACTUAL CHRISTMAS DAY wasn’t as crazy or celebratory; in fact, in some respects, it was just an ordinary day, a day of recuperation like New Year’s Day is in most places. Still, many places weren’t open in the city, so most Bogotans took advantage of the warm weather with a day trip — which is what I did with Hugo and Gloria. We drove out of Bogota again, to La Calela just on the other side of the mountains that flank the eastern part of the city. We sat out at one of the traditional eateries overlooking the greenery around the big lake/reservoir. After selecting freshly grilled meats prepared over a fire — chicken and wild pig — the three of us dined outside, relaxing with our food and rebajo (the beer/soda mixture). Other than the brief moment when I received a Christmas greeting from Steph on an unexpected cell phone call, it didn’t really feel like Christmas — those feelings were all used up the night before in Colombia after all. (Also, I’m used to the classic image of Christmas with the snow, or at least cold weather, and it was about 70°F out.) The rest of the rather ordinary day was a casual one, as if it was any given Sunday, with us out for a drive. Monica’s parents showed me some of the little hamlets, including Sopo, and the green countryside of grazing cattle — it’s no wonder all the big dairy companies had a factory nearby. On the way back to the city, we checked out the view from the mountainside mirador. Bogota looked just like it did on my first day, only not as new — I’d been in town for a week already. Anyway, in the end, it was an interesting Christmas in Colombia to say the least, even without the snow, cold weather, Chinese food, or movies. I was happy to have not spent the holidays alone — and fortunately I was in good company. so the word for “goat cheese” in French is the word for “great” in spanish? well, I do love goat cheese so that makes sense somehow..
You don’t worry to get any sort of required detail about the bottega veneta handbags as internet is a best source to find all necessary information related to these used louis vuitton handbags .Designer Replica are the splendid hermes replica handbags which fulfill all the requirements of a good cheap fendi handbags and make you glad of owing your wanted louis vuitton knockoff handbags accessory to compliment your stylish designer dress and to enhance your personality in any gathering, function or party. Huge variety and availability of the Mulberry leather bag make it, easy to choose your desired Louis Vuitton handbags easily, if you want to match with your dress. ?In order to, place an order to purchase the versace bags , the concern company gives you the address of its site and you have to log on at that address to place an order of celine bags . So, you have the perfect outfit put together but it is still missing something special. You have tried every outlandish pair of earrings you have and every bracelet you own as well, but nothing seems to tie the knot. What about a matching GUCCI Wallet replica? Every woman has a favorite designer handbags that is the perfect color, size, and style, but sometimes the most efficient Marc Jacobs Handbags is not always the most stylish. cheap Juicy Couture Handbags can take care of this problem right away. Balenciaga Louis Vuitton Handbags replica will make any outfit complete and you will never have to worry about it ever again!The perfect designer handbags at discount prices offers a color palette and arrangement that caters to different color assortments in an outfit. Your cheap Giverchy Handbags should be able to work with a t-shirt and jeans as well as it works with a dress suit. Loewe Handbags are perfect for a night out on the town or a nice dinner reservation. The only cons to these types of Dolce Gabbana Handbags replica are that they are often times oddly shaped or not big enough, but then again you must remember that these purses are not made for efficiency, but for the look. These Jimmy Choo replica Handbags are not exactly the perfect Prada Handbags replica for shopping or all day trips with a lot of things to carry.A cheap AH Handbags that is not actually designer is actually pretty commonly found nowadays. Many people realize that spending three to five hundred dollars for a Coach Handbags replica is outrageous. Having a cheap Miu Miu Handbags that looks identical to a replica Marc Jacobs Wallet but does not have a signature tag is easy to deal with when the price tag has a low and affordable price that does not make you cringe when you see it. If you can find a great looking purse that you like, why not save your money and enjoy the look alike?There is a common misconception that fashion revolves around brand names when really a piece of fashion should be graded upon its look and how it is used to portray a look. A great looking Dior Wallet could be from a consignment shop and could show off some better looking fashion then some brand name replica Prada Handbags that everyone is getting their hands on. The key to a great replica Christian Dior Handbags is to be unique. Having a replica Jimmy Choo Handbags that no one else has is better than getting a Fendi Handbags that everyone has seen and has already purchased for themselves.Great fashion is not about how much you spend on it, but it is about how you work and wear it. A great replica Marc Jacobs Handbags might be gorgeous and you might want to buy it, but if you are not going to use it in a way that makes a statement then you might as well move on to something else. Fashion and presenting a fashionable statement takes a little bit of guts and edge to wear it and wear it loud. It is often taken as a weird thing when people do not follow fashion trends when really they are simply being unique and presenting better fashion statements than everyone else in the room. louis vuitton bags are considered as every woman’s dream to own. It’s born for the cause of women’s beautifulness. We will strive for this goal-make each women become much more beautiful and much more charming. we provide a lot of gucci handbags for you to choose.prada handbags AAA grade replica has been established, let us closer to the famous handbag brand, our love. rain coat from Gap that I was dying to wear,HP Pavilion DV6500 Adapter and… well… can you imagine?? sportin’ her cute new rain slicker in just the perfect shade of Tennessee Vols orange..
cheap juicy Have a plan for reaching links and more jewelry your child. If your family fake bvlgari jewelry needs to reach you because estate jewelry cartier of an emergency, they can louis vuitton handbags clearance pass a message to you louis vuitton ring through the Office of Overseas louis vuitton sunglass Citizens Services at 202-647-5225. This louis vuitton handbags knockoffs office will contact the embassy burberry belts or consulate in the country bvlgari earrings where you are traveling and levis belts pass a message from your dior bracelets family to you. Remember consular louis vuitton speedy bag officers cannot cash checks, lend epi leather money or serve as your juicy necklace attorney. They can, however, if cheap cufflinks the need arises, assist you belts for men in obtaining emergency funds from burberry outlet your family, help you find replica louis vuitton tie an attorney, help you find pharrell louis vuitton jewelry medical assistance, and replace your wholesale coach handbags lost or stolen passport. Good replica Audemars Piguet watches What people know about Swiss is a burberry replica watches. fake SubMariner watches are known by people everywhere. Due to the great recognition, the particular fake Louis Vuitton watches are directly influenced and well received by many people because they offer people a good opportunity to appreciate the same deluxe at payable rates. replica Breitling watchesare u boat replica Hermes in the world You will never regret of owing a Hamilton watches. At the moment, a large number of fake Diesel can be ever since the very market that you can invariably find one which can perfectly suit you. They are so similar with the very originals that most people have difficulty in spotting these kind of two versions out. Any detail of the exact appearance like case, dial, markers, glass is 100% mirrored. What is more, the exact internal parts this sort of seeing as movement are also cautiously constructed to ensure the very reliability and splendid performance. Yet, they absolutely have something various. The main difference should be their making materials. The particular authentic timepieces are mostly constructed from real precious stones and metals while the replica ones is made of synthetic gems and gilding. This is the particular key element to explain their large gap in price. A replica rolex submariner is always an extremely rolex daytona replica. Ordinary people cannot own such a replica Jaquet Droz. That is why patek philippe replica are so hot recently. With all the price of an fake Chronoswiss watches, you can buy a variety of replicas. Since the style and design and functions of an imitation timekeeper are approximate to the real, why not spend your hardly owned money wisely and buy the former model. This is a cartier fake DKNY watches, cheap yet stylish! fake Burberry watches present a perfect blend of qualityFor the Chinese replica Alain Silberstein lovers in general, Girard Perregaux fake Mr. cartier watches Zero feel Montargis 400 alone panerai replica are a affectionate of enjoyment, fake Guess watches because there are actual abounding collections in the country which cannot be seen. tag Heuer watches fake But even the most accomplished collectors, replica Guess if behest in being to participate in Geneva, alain Silberstein fake Switzerland, replica Porsche Design watches is not a simple thing, fake Concord but this time, replica Chaumet such problems no best exist. fake Hamilton watches Because you can buy the rado watches replica at the House of Lords exhibited in Beijing at the NAG. replica Burett watches Even if you do not alone go to Geneva, Zodiac watches replica but aswell coursing to his affection beat section. replica Rotary watches We have found that the aboriginal amateur have started to be spokesmens in the affluence audemars Piguet watches industry. fake Field and Stream watches Display of acceleration and affection of the athletes and the following of arete no agnosticism fake Band with absolute there is a accustomed affair point. As aboriginal as 1927, began with the eyes of Rolexs affiliation with the athletes. replica Milgauss watches At that time, diesel watches adolescent British changeable athletes Mese Edith Liz Rolex Oyster Perpetual fake Ebel to abrasion auspiciously beyond the English Channel, Jaeger Lecoultre replica Rolex in London “Daily Telegraph” foreground page account that a huge account to the world, replica Patek Philippe watches so to actualize a the amateur endorsement ulysse Nardin watches precedent. fake Breitling watches Since then, fake Blancpain the cast has consistently accurate the sailing, fake Giordano watches golf, replica Accutron tennis, explorer watches replica equestrian and added sports, replica Porsche Design abounding well-respected players accept become the agent for band watches replica. fake Triumph watches present a perfect blend of quality, patek Philippe watches elegance and class. fake Omega watches These timeless accessories have become the heartthrob of every person around the world owing to their endless qualities and benefits. fake ExplorerUnlike other replica Ferrari watches,Gerald Genta watches fake having Rolex Longines fake implies living luxury. Jaquet Droz fakeThe wonderful designs, Grimoldi fake breathtaking styles, IWC watches striking colors and a variety of materials make these accessories simply the best choices for all. No matter if you want an accessory for a wedding or a business meeting, esq replica a beach party or a formal dinner, you will be able to realize all your dreams in the form of fake Sea Dweller watches. New York, said if he can come to NFL Jerseys Wholesale Dwyane Wade Jerseys big, will stay. Obviously P90X, McGrady their assessment is still high, his own self-confidence NFL Jerseys Authentic or champions target.Then in the transfer market P90X Workout, New York not intend to continue to hold NFL Jerseys Sale, still have that McGrady starting salary at P90X Workout Schedule the middle and qualification NFL Jerseys Cheap, led to the bulls and talk, and Cleveland fruit Turbo Fire. Finally, he found himself employment problem NFL Jerseys UK, to really take refuge in the piston Slendertone System Abs, the next season almost zero scudetto chances. system74 The new Timberland boots is a kind of life style,modern culture in modern life is a kind of special performance.Timberland 6 inch boots in contemporary life often become shoes.Become a kind of fashion symbol,covers every aspect of life,such as a country walk, sports, travel,shopping,timberland boots uk etc.Please enjoy yourself,colorful life,cheap timberland boots has become a modern pursuit of life,not to quality of life index.The concept and connotation and timberland boots sale with this new life function was closely related with the ideal mode. There are may types of timberland boots available on the market. These include timberland boots sale such as mens timberland boots and timberland boots uk,timberland waterproof boots, the following areas of different shapes, materials, style and decor. Many families and women worry about what to wear when they talk to their children that many women already know the timberland shoes special timberland 6 inch boots,timberland roll top boots. 2010 autum winter season, burberry sale series continue present low-key elegant temperament. By the use of drape this season, the burberry outlet side in a knot, without too much color decorate, it becomes rich content and burberry scarves full stereo feeling. In addition, burberry scarf collocation also use this season in the climax, based on the burberry cashmere scarf plus drape, rhombus case grain with abstract painting as the general effect was carefully. By recognizing and understanding <a >2010 pandora charms</a> the values of all American Indians on the jewelry, we can <a >buy pandora</a> learn to admire the beauty of this token, the American <a >pandora beads australia</a> culture. The jewelry is timeless and it <a >cheap pandora</a> would remain popular for a long time to come. None of the designers could replace the demand for <a >cheap pandora beads</a> the pieces till date such is the beauty of the jewelry and the <a >cheap pandora bracelets</a> craze for it. The jewelry has to be cared <a >pandora beads charms</a> for as to retain the sparkle. You can <a >discount pandora beads</a> easily locate its office <a >discount pandora bracelets</a> in Bangkok, Thailand. High quality silver jewelry produced by this company is being supplied to worlds leading chain stores, jewelry wholesalers, catalog <a >new pandora charms</a> companies, high street silver jewelry <a >wholesale pandora beads</a> shops in Germany, Spain, Italy, France, Australia, Brazil, Japan, Russia, UK and US. By recognizing and understanding 2010 pandora charms the values of all American Indians on the jewelry, we can buy pandora learn to admire the beauty of this token, the American pandora beads australia culture. The jewelry is timeless and it cheap pandora would remain popular for a long time to come. None of the designers could replace the demand for cheap pandora beads the pieces till date such is the beauty of the jewelry and the cheap pandora bracelets craze for it. The jewelry has to be cared pandora beads charms for as to retain the sparkle. You can discount pandora beads easily locate its office discount pandora bracelets in Bangkok, Thailand. High quality silver jewelry produced by this company is being supplied to worlds leading chain stores, jewelry wholesalers, catalog new pandora charms companies, high street silver jewelry wholesale pandora beads shops in Germany, Spain, Italy, France, Australia, Brazil, Japan, Russia, UK and US. improve enterprise retiree annuities level, now per capita monthly allowance basic annuities reach 1269 yuan.